Gov. 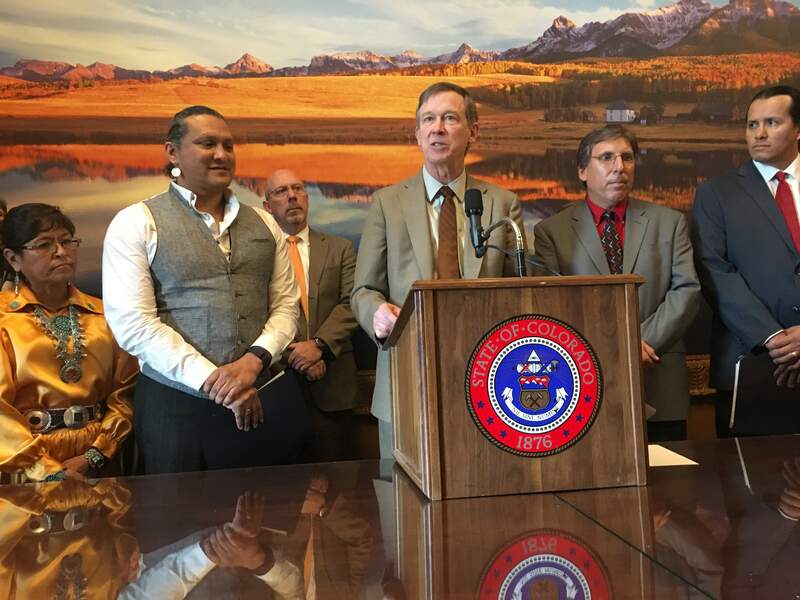 John Hickenlooper on Monday stands with members of the Governor’s Commission to Study American Indian Representation in Public Schools to announce findings, including that schools should eliminate derogatory and offensive Native American mascots, imagery and names. The commission is being hailed as a national model. DENVER – Members of a commission that studied Native American mascots in schools on Monday reported success, blazing the way for a national effort. Gov. John Hickenlooper, a Democrat, last year announced the commission, which was charged with studying how communities can respect the culture of Native Americans while also maintaining traditions. After five months of community meetings and discussions, the 15-member commission established four principles, including eliminating derogatory and offensive Native American mascots, imagery and names. Rather than mandate a solution through legislation – which was proposed in the Legislature – leaders said a better approach is to facilitate community discussions. “The solution you get to by opening your arms and opening your heart, and actually going and listening, and going through this longer, more time-consuming process, is a much stronger resolution than a legislative one,” Hickenlooper said at a news conference in his office, with members of the commission, including representatives of the Southern Ute Indian Tribe and Ute Mountain Ute Tribe. Four schools in Colorado with Native American names and imagery have taken steps to facilitate a conversation as a result of the commission’s meetings. Strasburg High School, home of the Indians, has reached out to tribal representatives of the Northern Arapahoe in Wyoming to design a more culturally appropriate logo. Northern Arapahoe members will visit the school Friday to provide additional cultural information. Loveland High School administration, home of the Indians, has also expressed support for reaching out to tribal nations. Similarly, Lamar High School, home of the Savages, and Eaton High School, home of the Reds, also are discussing how to set a tone for civil dialogue in an effort to hear from both sides of the community. Jeff Rasp, principal at Strasburg High School, said he watched his administration go through a sort of “evolution” on the subject. The board had opposed legislation last year that would have prohibited schools from using Native American mascots. Recognizing and respecting tribal sovereignty while pushing schools to enter into relationships with tribes.Respecting local control of school boards while encouraging those boards to engage in Native American conversations.Focusing on education and outreach.The commission was such a success, it caught the attention of the White House, which is considering taking the strategy to other states. It also complements an initiative by sportswear manufacturing giant Adidas to provide financial and design assistance to schools that want to change Native American mascots. “Harmful stereotypes affect students’ lives day in and day out,” said Bill Mendoza, executive director of the White House Initiative on American Indian and Alaska Native Education.